Julius A. Stratton '23, who served as MIT's eleventh president from 1959 to 1966, died of pneumonia on June 22, at the age of 93. There will be a memorial service on Wednesday, Sept. 21 at 1 p.m. in Kresge Auditorium. Stratton was an internationally-known scientist who distinguished himself as both an educator and an administrator. He had been associated with MIT since his undergraduate years at the Institute, which began in 1920. During his administration, Stratton revised the curriculum and expanded the graduate program. In the last three years of his tenure, more than $40 million in new buildings were constructed. Stratton was also revered as a champion of student welfare. He helped with the development of McCormick Hall, the allotment of living space for married students, and the expansion of athletic facilities. When the student center opened in 1965, the student body requested that the building be named after him, in recognition of his devotion to student life and student affairs. Along with his dedication to MIT, Stratton served under several U.S. presidents on a variety of national boards and committees. Also, he was active in professional and scientific organizations and was a trustee of several education and cultural institutions. Chairman of the Corporation Paul E. Gray said, "As professor, the first director of the first university interdepartmental laboratory, provost, chancellor, and as president, Jay Stratton provided distinguished, wise, and compassionate leadership to the Institute during a time in which the relationship between the research universities and the federal government was in flux, and the complexion and mission of MIT was also in transition. Jay's strong commitment to the arts and humanitites at MIT was particularly important in a period when those activities were first flowering." President Charles M. Vest said, "Jay Stratton's leadership in science and academia helped shape not only MIT, but institutions throughout the nation." Stratton was born in Seattle, on May 18, 1901. When he was young, his family lived in Germany, and he started school there. Later, growing up in Seattle, he developed an interest in the then-frontier field of radio. Stratton came to MIT in 1920, and earned his SB in electrical engineering in three years. As an undergraduate, he was secretary of the Radio Society. He returned to MIT for his graduate work and received his master of science degree in electrical engineering in 1926. He did a doctoral study at the Swiss Federal Institute of Technology and received an ScD degree in mathematical physics in 1928. He again returned to MIT, this time as an assistant professor in the electrical engineering department. He later transferred to the physics department, where he became an associate professor in 1935 and a full professor in 1941. His research included work on the propagation of short waves, which at the time were not as well understood as the long waves used in radio transmission. He was a leading member of a group at MIT engaged in the study of electromagnetic theory and microwaves, laying the foundations for modern electronics. In 1941 he published "Electromagnetic Theory," a scientific classic regarded as an authoritative text. He was also the author of many articles and technical papers, as well as the co-author of several books. In the 1940s, Stratton worked on radar development at the newly created Radiation Laboratory, and in 1942 he went to Washington, D.C. as an expert consultant. He was active in improving the use of radar for the war effort by organizing technical advisory committees to the Air Force on programs of ground radar, radar fire control, and radar bombing. In 1946 he was awarded the Medal for Merit for his services. 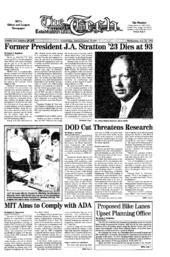 As an administrator, Stratton had a great impact on MIT's directive and expansion. Through his efforts, the School of Humanities and Social Sciences was created in 1950. With his experience as director of the Research Laboratory of Electronics, which started out as the Radiation Laboratory, he set the standard for the organization of interdisciplinary programs at MIT and elsewhere. Stratton became MIT's first provost in 1949 and was also made a vice president in 1951. He was named chancellor in 1956 and became acting president in 1957 when then-President James R. Killian Jr. was appointed special assistant to President Dwight D. Eisenhower for science and technology. In January 1959, Stratton became president. He retired in 1966 and was elected a life member of the MIT Corporation. He was a life-member emeritus at the time of his death. After a tenure as Chairman of the Board of Trustees of the Ford Foundation from 1966 to 1971, he returned to Cambridge to work on a history of MIT. Stratton served as vice president of the National Academy of Sciences from 1961 to 1965. In addition, he was a member of the American Philosophical Society and the Council on Foreign Relations; a Fellow of the American Academy of Arts and Sciences, the American Physical Society, and the American Association for the Advancement of Science; a life Fellow of the Institute of Electrical and Electronics Engineers; a member of Sigma Xi, Tau Beta Pi, and an eminent member of Eta Kappa Nu. He was a Life Trustee and Member of the Corporation of the Boston Museum of Science and member emeritus of the Draper Laboratory. He received the Distinguished Public Service Award of the U.S. Navy, the Medal of Honor of the Institute of Radio Engineers, the Faraday Medal of the British Institution of Electrical Engineers, and the Boston Medal for Distinguished Achievement. He held 17 honorary degrees from universities in the United States, Great Britain, and Canada. Stratton is survived by his wife, Catherine N. (Coffman) Stratton, three daughters, Catherine Nelson Stratton of London, Mrs. Lew (Cary) F. Boyd of Newbury, Mass., and Mrs. Laura Thoresby of London; and a granddaughter, Caroline Stratton Boyd.